I know there has been a lot of questions about how to post a photo in a message. I will try to explain it. If someone else can make it more clear, feel free! Okay the first way is to simply upload your image to the OrchidTalk server. 3. Click on "Manage Attachments"
4. A pop-up window will open and will give you a blank text box with a button that says "Browse" -Click on that button and locate the file you wish to upload. 5. Once you have the file selected click "Upload"
6. Finish any additional text in your message and then hit "Submit"
3. Type the following in order: Put the letters "IMG" without the ""'s in square brackets. The brackets are located next to the "P" on your keyboard. -note: be sure to include the "http://www." with your image location on the Internet. T4tlrman, alliekat, kdennis14 and 1 others like this. Hey, I just figured out something that will make posting a photo the second way easier! 7. Finish your text and hit "SUBMIT"
Have you watched the OrchidTalk Help Video number 3? That teaches you how to upload a photo as an attachment to the forum. To use the Image Icon , you must have already placed your photos on the internet somewhere. They cannot be on your personal computer. If they are on your personal computer, then you will need to upload them as shown in the video. If your images are not the correct size, you can download the Image Resizer for windows. Read the instruction for the image resizer on this page. EDIT 7-4-2010: Now we have an Editor built into the OrchidTalk Forum. Visit the OrchidTalk Photo Editor Page to edit your photos for upload in your posts. It is easy to post a photo from your flickr photostream. 1. Using Fire Fox Browser, go to your flicker page that has the photo you want to share. 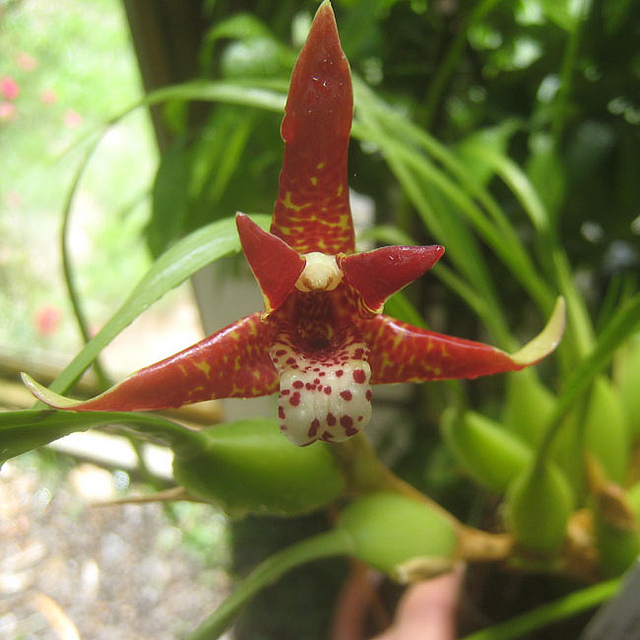 For my example I have chosen a photo from OrchidTalk's Flickr page. Max | Flickr - Photo Sharing! 2. While on the page, right click in the white area of the page (not the image) and choose "View Page Info"
3. A popup window opens that will have some tabs. Choose the "Media Tab" by clicking on it. 7. Please remember that our server saves a copy of this photo and that we do not allow back links to these commercial sites. It is really easy to post a photo from your photobucket photostream. 2. While on the page, right click on the image and choose "View image"
3. The image will open by itself in the browser window. Alternatively, if you don't have Firefox, simply click on the DIRECT image link in the box as in the photo below. Enter this into the pop-up here on OrchidTalk to post your photo without the back link. Please also remember to only post up to 4 (four) photos in a single post. Some people still access the forum through slower internet connections. More than four images causes their page to load very slowly. RESPECT! 3. find the photo you want to post & tap/hold on it until a menu pops up. Maura originally posted these instructions and I thought I would share them here for those looking for this information. 6) When the next window comes up, you can simply have the photo go into your general Pictures file, or you can make a new folder to break them down - I usually click on new folder, name that something relevant, and then click Export. 7) Now go back to your thread and click on Go Advanced at the bottom of the Reply Post. That brings up a window for your OrchidTalk photos. In the top right corner, click on Add Files. 9) That will bring you to your Mac Picture files, where you can highlight the photo you want to add- click on the photo highlighted and it will appear in the window at the top right. 11) You will see your photo in icon size added to the general list at the top, but also at the bottom, marked with a blue x in the box. 12) Click on Insert Files Inline, or whatever it says, then click Done. 13) This will return you to your draft reply post and it will show up as [Attachment xyz]. 14) Type in whatever you want to say about the photo in the draft, bearing in mind that the attachment will appear as a photo wherever it appears in your draft - i.e., if you type your post AFTER the attachment, the photo will show up before your comments on this. Cut and paste so that things are arranged the way you want them. We've added a way for our mobile users to quickly snap a photo using their phone or tablet and upload it to the community using tinypic. Then, locate your photo on your device or take a new photo with your device. Make sure you see the choice MESSAGE BOARD in the drop-down option. If you do, hit UPLOAD and wait until you see your image and a URL for that image. Now, tap once the rectangle and it will select the URL of the image. Hold down over the selected URL and you should get a copy / cut menu on your mobile device. Choose either copy or cut. Then, paste your selected text (the URL) into your message where you would like your image to appear. I found when testing it is better to write out my message, then upload my image and paste the url into the message. I hope this makes posting images via your mobile device easier.